Class-3 jobs. Last date to apply online for this GSSSB Office Asst, Clerk jobs is 02-11-2018. 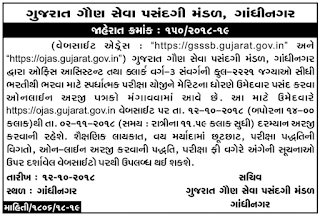 Official website to apply online for this GSSSB Clerk Class-3, Office Assistant jobs is www.ojas.gujarat.gov.in. Candidates will be shortlisted on basis of marks in Written Exam and interview for GSSSB Clerk, Office Assistant recruitment 2018. There are total 2221 vacancies are available in this GSSSB recruitment 2018. Exam Pattern and Syllabus, Post wise vacancies, educational qualifications, salary, selection process, and other details of GSSSB Clerk Class-3, Office Assistant jobs recruitment 2018 is given below. There are total 2221 posts in this Gujarat GSSSB recruitment 2018. 1. Clerk Class-3, Office Assistant Posts age limits are 18-35 years. Age relaxations are applicable for Female candidates, SEBC, ST candidate as per GSSSB Norms. For all the posts degree qualified candidates are eligible to apply. Computer Knowledge certificate or Degree or Diploma in Computers is mandatory. For all the posts salary will be Rs.9300-Rs.34800 per month. Application fee is Rs.100 for all the posts. 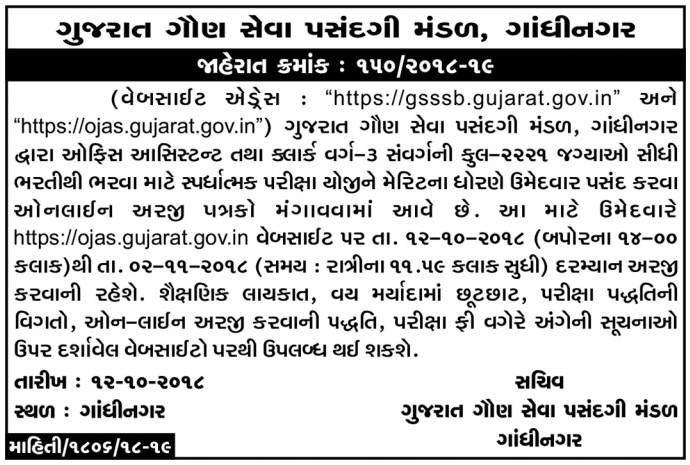 Candidates selection for this Gujarat Gaun Pasangadi Seva Mandal recruitment will be based on written exam and Computer Practical Test. Exam Pattern: Written exam will be conducted for 200 marks. Exam is OMR based. Exam duration is 2 hours. Those who are looking for a government job and having computer knowledge and degree qualification, they can apply online for this Gujarat GSSSB Clerk Class-3, Office Assistant jobs on or before 02-11-2018. Official website to apply online is www.ojas.gujarat.gov.in.